The purpose of this course is to develop an appreciation and understanding of the exploration and interpretation of data. Topics include display and summary of data, introductory probability, fundamental issues of study design, and inferential methods including confidence interval estimation and hypothesis testing. Applications and examples are drawn from a wide variety of disciplines. When cross-listed with biology, examples will be drawn primarily from biology. Special Notes: Not open to students with AP credit in statistics or students who have completed Economics 209 or Psychology 200. An overview of principles of statistical analysis and research design applicable to psychology and related fields. Topics include descriptive statistics and inferential statistics, concepts of reliability and validity, and basic concepts of sampling and probability theory. Students learn when and how to apply such statistical procedures as chi-square, z-tests, t-tests, Pearson product-moment correlations, regression analysis, and analysis of variance. The goal of the course is to develop a basic understanding of research design, data collection and analysis, interpretation of results, and the appropriate use of statistical software for performing complex analyses. Ms. Andrews, Mr. Clifton, Ms. Trumbetta. This course is an introduction to statistical analysis and its application in economics. The objective is to provide a solid, practical, and intuitive understanding of statistical analysis with emphasis on estimation, hypothesis testing, and linear regression. Additional topics include descriptive statistics, probability theory, random variables, sampling theory, statistical distributions, and an introduction to violations of the classical assumptions underlying the least-squares model. Students are introduced to the use of computers in statistical analysis. The department. This course equips students with the skills required for empirical economic research in industry, government, and academia. Topics covered include simple and multiple regression, maximum likelihood estimation, multicollinearity, heteroskedasticity, autocorrelation, distributed lags, simultaneous equations, instrumental variables, and time series analysis. The department. This course in introductory probability theory covers topics including combinatorics, discrete and continuous random variables, distribution functions, joint distributions, independence, properties of expectations, and basic limit theorems. The department. Applied Statistical Modeling is offered as a second course in statistics in which we present a set of case studies and introduce appropriate statistical modeling techniques for each. Topics may include: multiple linear regression, logistic regression, log-linear regression, survival analysis, an introduction to Bayesian modeling, and modeling via simulation. Other topics may be substituted for these or added as time allows. Students will be expected to conduct data analyses in R. Ms. An. Analysis of the classical linear regression model and the consequences of violating its basic assumptions. Topics include maximum likelihood estimation, asymptotic properties of estimators, simultaneous equations, instrumental variables, limited dependent variables and an introduction to time series models. Applications to economic problems are emphasized throughout the course. Mr. Ruud. Prerequisite: Econ 210 and Math 122 or equivalent. An introduction to statistical theory through the mathematical development of topics including resampling methods, sampling distributions, likelihood, interval and point estimation, and introduction to statistical inferential methods. The department. For students who have completed Math 341. Students in this course attend the same lectures as those in Math 242, but will be required to complete extra reading and problems. Ms. An. Not an option for students who score a 4 or 5 on the AP Stats Exam. 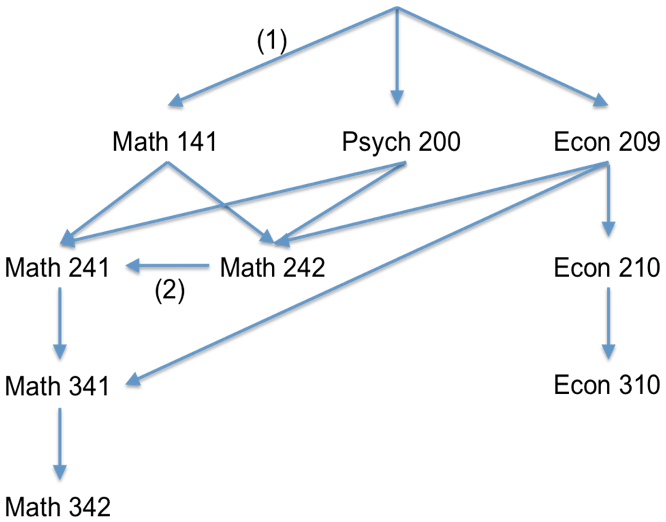 Consider Psych 200 or Econ 209; or for those with computing background, consider Math 242. Not an option for students who have taken Econ 209. Consider Math 341 after taking Econ 209 and Math 242; or consider Math 341 and Math 342 after taking Econ 209.